You deserve a break today. Hell, we all deserve a break from this idiocy. 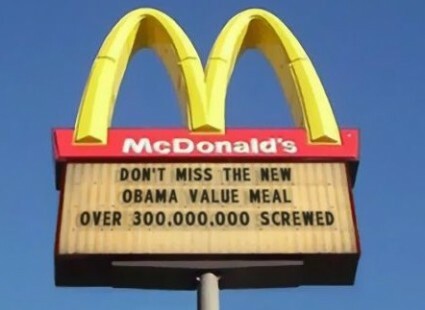 Introducing McDonalds’ new Obama Value Meal – order anything on the menu and the next guy in line has to pay for it. I see their jokes are as high quality as their food. Yes, it is true — McDonald’s does put a lot of time and effort into providing wholesome food that people enjoy eating. While some humorless asshats take an elitist pleasure in making fun of it, I find that as an occasional treat, McDonald’s food is very enjoyable and healthy. Taken to an extreme, of course, it would be a poor diet. Clean house in Washington DC quickly? If they empty GITMO: Send all the TAX CHEATS in Congress, the White House and Government Employees there. Is there enough room? Wouldn’t it be grt to waterboard these folks and see them all in orange jumpsuits? Two all beef patties, special Caulk sauce, lettuce, cheese, pickles, onions on a sesame seed bun, and another million saved jobs! You buying this value meal for the unemployed and health care reform?